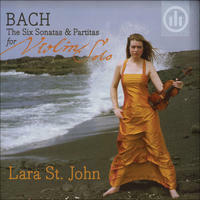 Lara St John : CD2 - Bach - The Six Sonatas and Partitas for Solo Violin. Her first Magnatune release is our all-time best-selling album, and now Lara St. John's "awe-inducing" recording of Bach's Sonatas and Partitas for Violin Solo is here as well. When most classical artists record technically challenging works like this one, they typically have to repeat certain phrases over and over during the recording process, but when Lara St John recorded this album at Skywalker Ranch, she played only complete versions of each movement, so the resulting music sounds incredibly fresh and alive. Her approach is especially appropriate for Johann Sebastian Bach's Six Sonatas because they're known for their musical freedom of movement. "Breathtakingly beautiful," says Allmusic.com. License Bach violin concertos by Lara St John for your project. Play the music of Lara St John in your restaurant or store.